Masticating juicers are the best juicers for leafy greens. They squeeze out every drop, helping you get the most juice out of your vegetables. Leafy greens, such as kale, Swiss chard, collard greens, and spinach are superfoods, providing your body with the best nutrients in the highest amounts. But don’t worry, all those nutrients don’t come with a lot of calories! Stay focused on these tasty veggies and you’ll soon feel the benefits in more energy and a more efficient body. But how do we get the most out of these super vegetables? Aren’t all juicers basically the same? No way! Here’s why. Every type of juicer comes with its advantages and disadvantages. Centrifugal juicers, for example, are efficient for apples, carrots, beets, and other hard fruits and veggies. With their fast-spinning blades, they chew right through tough foods. They are also usually cheaper than masticating juicers. They are perfect for juicing beginners, who mostly want to make fruit juices. If you want to take your health one step further by juicing leafy greens, centrifugal juicers aren’t ideal. They are not designed for the job, and you will get almost no juice out of your expensive greens. Leafy greens are lightweight, the fast-spinning blades on centrifugal juicers barely tear the leaves before shooting them into the pulp extractor. Masticating juicers (aka a slow juicer, or cold press juicer) make use of gears instead of blades, grinding the greens instead of slicing them. The rotation of masticating juicers is usually below 100 RPM, as opposed to centrifuges which work at up to 22,000 RPM. With masticating juicers, you not only get the most juice out of your greens, but your fresh juice will last longer since the slow juicing process protects the juice from oxidation. You can store juices made from masticating juicers for up to 72 hours in your fridge, without losing too many nutrients. That’s why juice bars and health-conscious people all over the world prefer masticating juicers over centrifugal juicers. I know slow juicers can get expensive, that’s why I divided this article into three categories. Each category includes the best juicers for vegetables within your desired budget. The Aicok Slow Juicer is one of the most compact and inexpensive masticating juicers on the market. Don’t be fooled by its small size and low price; this juicer is powerful. As a slow juicer, it helps you get the most out of your leafy greens. It performs as well as some of the more expensive masticating models. As more people discover the benefits of juicing vegetables, slow juicers will become more and more affordable. You wouldn’t be able to find a masticating juicer for less than $200 just a few years ago. Basically, the Aicok Masticating Juicer comes with all the advantages of a slow juicer for the price of a centrifugal juicer. It runs at 80 RPM, and the motor noise is less than 60 dB. Perfect if you want to make your healthy green juices in the morning, without waking up your family members. The juicer is super easy to use. There are only 2 buttons: an On/Off Switch and a Reverse Button. Simply wash and precut your veggies, turn on the juicer, and you’re good to go. The Reverse Function helps you unstick a jam of veggies if you ever find yourself in need. It couldn’t be easier! All removable parts are dishwasher safe and BPA-free. No dishwasher? No problem! Quickly rinse off all parts under running water and use the handy scrubbing brush if need be. It takes less than 5 minutes. If space is limited, you will love this compact juice extractor. It’s one of the most compact slow juicers out there, and the sleek design looks great on any countertop. The Aicok Slow Juicer comes with a 2-year limited warranty that can be extended to 3 years. Cons: The juicer is made out of plastic. It’s not as durable as high-end masticating juicers. Although the Aicok Juicer is great at juicing leafy greens, juice yield from hard produce could be better. Overall Opinion: You can’t go wrong with the Aicok Slow Juicer. It’s one of the most affordable masticating juicers on the market and is very efficient at juicing leafy greens. It’s easy to clean and the juice quality is excellent. Other customers seem to agree with me, as it has almost exclusively positive reviews. When it comes to masticating juicers, there’s one brand that stands out: Omega. They have been around for over 50 years and are here to stay. The Omega J8004 is a great starter machine. It’s one of the more affordable masticating juicers, but it’s a durable machine that produces high-quality juice. The J8004 is the same machine as the Omega J8006. They share the same motor and functions, the only difference is the color. The J8006 is available in 8 different colors, while the J8004 is white. The J8004 is usually less expensive than the Omega J8006 and therefore a great choice for budget shoppers. This Omega Juicer is much more than a simple juice extractor. You can make nut butter, baby food, pasta, and even grind spices, herbs, and coffee. All parts you need to turn your Omega Juicer into a food processor are included in the box. The juicer derives its strength from an incredibly powerful 2 horsepower motor, which helps you get the most out of your leafy greens. The slow speed of 80 RPM preserves nutrients and gives you the best juice quality possible. Because it doesn’t operate at a fast speed, even lightweight ingredients such as spinach, kale, and wheatgrass are juiced efficiently. This means less waste and higher juice yield. This will help you save money in the long run, especially if you’re juicing organic produce and you want to get the most out of your fruits and veggies. The low-speed motor operates quietly. You won’t need to worry about disturbing other people while making your healthy green juices. If you’re an early morning juicer, you will appreciate the relatively low noise operation. The Omega J8004 is easy to assemble, operate, and clean. I know many people put it in the dishwasher, but I wouldn’t recommend it. It takes less than five minutes to give it a thorough cleaning by hand. Omega is so confident in the quality of the J8004 that it comes with the longest warranty in the juicing industry. You get a 15-year warranty against any manufacturer errors or parts defects. Their customer service is stellar. Cons: The feed chute is quite small, and you’ll need to precut your fruits and veggies. 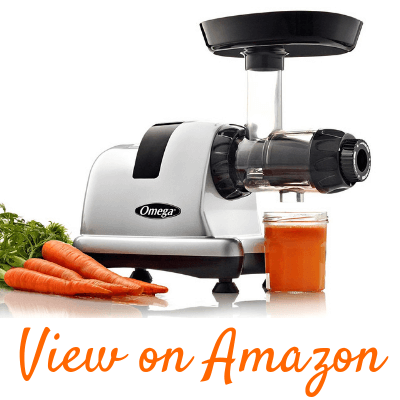 Overall Opinion: The Omega J8004 is much more than just a simple juicer. It’s a decent food processor which you can use to make healthy nut butter, pasta, baby food, and grind coffee beans. The juicer is one of the best juicers for juicing leafy greens, as the slow speed and the powerful 2HP motor helps you get the last drop out of your vegetables. It has over 1,000 positive reviews, comes with a 15-year warranty, and continues to be a bestseller. You’ll have an excellent juicer for at least the next 15 years without ever having to worry about it. The Mooka Slow Masticating Juicer is another slow juicer, that won’t cost you an arm and a leg. Its specs and functions are similar to the Aicok Slow Juicer. The slow speed of 80 RPM results in minimal juice oxidation and makes your green juices last longer. The motor noise is less than 60 dB. It’s quiet enough to operate while you’re having a conversation in the kitchen. With such a low motor noise, you can make healthy juices any time of the day, without worries of disturbing others. Just choose if you want to juice hard or soft produce, and that’s all you have to do. For your leafy greens, you want to select the “Soft” Function, for hard produce such as carrots or beets, you choose the “Hard” setting. The Reverse Function prevents clogging; hit that and it will remove whatever is caught inside. All removable parts are 100% BPA-free so you never have to worry about nasty chemicals leaching into your green juices. You can put all the parts in your dishwasher or wash them by hand in less than 5 minutes. A 10-year warranty covers the motor, and a 3-year warranty covers all remaining parts. You will get a free recipe e-book with your purchase. If you are in need of more delicious juice recipes, try my Juice Recipes for Energy. Cons: It’s difficult to get replacement parts. You’ll get more juice out of your leafy greens using an Omega NC800 or other high-end juicers. Overall Opinion: There is not much difference between the Aicok Slow Juicer and the Mooka Slow Juicer. They cost almost the same and have the same functions and features. Both machines are good juicers for leafy greens and won’t cost you an arm and a leg. Simply choose the one you like best; you can’t go wrong with either one of them. Omega is one of the oldest juicing companies. They’ve been manufacturing juicers for over 50 years now. The NC800 is one of the high-end Omega juicers and is worth every penny. The NC800 is the same machine as the Omega NC900, the only difference is the color. The NC800 is less expensive than the NC900 and therefore a great choice. The NC800 is much more than a simple juice extractor. It comes with four attachments, turning your juicer into a food processor. You can make nut milk, nut butter, sorbets, baby food, or grind herbs or coffee; the Omega NC800 does it all. The 2 horsepower motor helps you extract juice from even the toughest veggies and grinds out the last drop. You’ll get the maximum amount of juice from minimum amounts of leafy greens. If you’re juicing primarily organic produce, the NC800 is sure to help you save a lot of money in the long run. This is impressive since the Omega J8004 is already a very efficient juicer. The NC800 has an 80% wider feed chute compared to older Omega models. It means less work for you. You won’t have to cut your leafy greens into tiny little chunks. The first juicer I owned had a small chute and it was a pain to stand there feeding the veggies in. Once you have tried this kind of juicer, you really learn to appreciate a wider chute; it saves a lot of time. The 2HP motor rotates at 80RPM, giving you the highest juice quality with the least amount of oxidation. You can store juice made with the NC800 for up to 3 days in your fridge. This is perfect if you want to make large batches of healthy green juice for a couple of days in advance. Learn more: How Long Does Fresh Juice Last. The motor noise is low; you will hardly hear it. If you’ve operated a centrifugal juicer before that sounds like an airplane taking off, you’ll appreciate the relatively low noise of the NC800. You can make your green juice all day, every day without disturbing others. There is an adjustable end cap which allows you to adjust your juicer and squeeze out more juice from even the toughest ingredients. For soft fruits, turn the cap to a low setting; 1 or 2 will do fine. For leafy greens and hard produce like carrots, set the pressure cap to a higher setting, like 4 or 5. The Omega NC800 comes with a 15-year warranty against any parts defects or manufacturer errors. Their customer service is A+! Cons: Compared to other juicers, the NC800 has more functions and features so it might take you a while to learn everything you need to know about this machine. Overall Opinion: If you’re looking for a high-end juicer that will last for many years to come, Omega is the to-go brand. The NC800 is the best juicer for leafy greens in the mid-price range. It extracts up to 25% more juice out of greens than the older Omega models. If you want to get the maximum juice out of your veggies, go for the Omega NC800. Omega has the longest extended warranty in the juicing industry, and you’ll have an excellent juicer for at least the next 15 years. The Breville Big Squeeze is a vertical juicer. It operates the same way as a horizontal juicer but stands upright. It’s a powerful beast, yet it’s one of the quietest (if not the quietest) slow juicer on the market. You can use it anytime without waking up the house. It comes with a powerful 240-watt motor. Most other high-end slow juicers only have 150 watts of juicing power. The durable motor and the slow speed makes it the perfect juicer for leafy greens. You can juice in bulk! Make many different green juices at a time and store them for up to 72 hours in your fridge without losing too many nutrients. Always store your fresh juices in airtight containers to keep your juice fresh. The Breville BJS700 is easy to assemble and use. In fact, there’s only one button. You press up to turn the juicer On, press down to put it in Reverse. The 3-inch feed chute is one of the widest of all the slow juicers on the market today. You can juice whole apples at once, without cutting them up. It’s a real timesaver. The spout plug stops dripping and lets you pre-mix your green juices. The exit chute for the pulp is much larger than other juicers. It doesn’t jam up nearly as much as other vertical juicers. However, if you do get something jammed in the machine, you simply use the convenient reverse mode, and it will get you back to juicing again in no time. The juicer is super easy to clean. All you have to do is close the spout plug, pour water down the feed chute, and let it rotate in the juicing bowl. Then just open the spout plug and allow the water to drain out. This will effectively pre-clean your juicer. Once you have done that, just rinse the parts under running water and you’re ready for your next juicing session. The Juice Fountain sounds like a jet plane, while you can hardly hear the motor of the Breville Big Squeeze. Not only does the Breville Big Squeeze yield 33% more juice than the Juice Fountain, but the color of the juice also looks delicious and there’s less foam compared to the cheaper centrifugal juicer. If you are short on countertop space, but still want a powerful juicer, go for the Breville BJS700. Like all vertical juicers, it’s compact and won’t take up much space. The juicer comes with a 10-year limited warranty. Cons: The pulp is not as dry as the Omega NC800, which means it’s less efficient. If you’re primarily juicing organic greens, I’d go for the Omega to get the most juice out of your veggies. Overall Opinion: The Breville is an excellent vertical juicer. The 240-watt motor handles leafy greens well. It’s compact and will only occupy a small area on your countertop. You can hardly hear the juicer working, and the juice quality it produces is as good as it gets. The Omega CUBE300S is the most beautiful juicer on the market today. It’s the newest machine offered by Omega, and for me, it’s love at first sight. It has an exciting cubic design, looks like no other juicer, and fits smoothly into most modern kitchens. The Cube is a horizontal masticating juicer. It works the same way as the Omega NC800/900 series. The main difference is the innovative design that takes up less countertop space due to the cube form. It’s more compact than most other juicers, and you can store it easily. The Omega CUBE300S also has a stronger 200-watt motor compared to the 150 watts in the Omega NC800/900. It will easily crush leafy greens and just about any type of produce you throw at it. It runs at a slow 80 RPM and helps you get the most nutritious green juice possible. The juicer operates so quietly, you don’t have to worry about disturbing others while making your healthy green juices. With four sides that are all roughly 10 inches long, it will fit well into a small corner in your kitchen. You won’t need additional space for its accessories. You can store all the parts inside the Cube so that you never have to worry about misplacing them. All plastic parts are 100% BPA-free. There won’t be any nasty chemicals in your green juices! The Cube is more than just a simple juice extractor. It’s a complete food processor. Omega calls it the Nutrition Center. You can make baby food, nut butter, nut milk, pasta dough, sorbets, or even grind coffee beans and spices. All parts to turn your Cube into a food processor are included in the box. All removable parts are dishwasher safe, but I suggest washing the parts of this beauty by hand. It’s not difficult to clean at all. Soak all parts in warm, soapy water and then simply rinse off under running water. You can clean this juicer in less than 10 minutes. The Omega CUBE300S comes with the longest warranty in the juicing industry: a whopping 15-year warranty against any parts defects or manufacturer errors. Cons: Yields slightly less juice from fruits and is heavier than a standard horizontal Omega Juicer. The juice yield from leafy greens is as high as other high-end Omega Juicers. It has nine parts in total, four more pieces compared to a standard horizontal juicer. Overall Opinion: The Omega Cube is a modern beauty and will fit well into a small corner due to its cube shape. The juicer is heavy, but you won’t want to move it anyway. It looks gorgeous. If you want a powerful juicer for leafy greens that’s different, modern, and easy to store, go for the Omega CUBE300S. The Omega J8007 is the follow up to the extremely popular J8004 model. The J8007 and the J8008 are precisely the same machines, the only difference is the color. The J8007 is silver in color, while the Omega J8008 is chrome-colored. The J8007 is usually a bit cheaper than the J8008 and therefore an excellent choice for budget-conscious shoppers. Omega Horizontal Juicers are much more than a juice extractor. It comes with six different nozzles that turn this unit into a decent food processor. Like some of the other models mentioned here, you can make nut butter, baby food, pasta, and even grind spices, herbs, and coffee. The Omega J8007 moves at a slow speed of 80 RPM, which helps protect your healthy vegetable juices from oxidation, and also keeps the noise level low. If you have ever used a centrifugal juicer before, you’ll appreciate that you now can make your juices in the morning without waking up the whole house. The juice yield from leafy greens is impressive, but it’s not as good as with the newer Omega NC800/900 series. The juice is relatively low in foam, and the taste is fresh and amazing. The 5th generation J8007 is now 100% BPA-free so you’ll never have to worry about any chemicals in your juices. Like the other horizontal Omega Juicers, the J8007 comes with a 15-year warranty. Cons: The J8007 has a smaller feed chute and is less efficient at juicing leafy greens than the Omega NC800. However, compared to other juicers, the juice yield is quite impressive. Overall Opinion: The Omega J8007 is a great juicer. If you’re on a somewhat tight budget, but still want a good juicer for leafy greens, the Omega J8007 is a good choice. The juicer comes with an impressive 15-year extended warranty. The Omega VRT350 is another vertical juicer. Its compact design takes up less space in your kitchen than traditional, horizontal slow juicers. It has a 150-watt motor and operates at a slow speed of 80 RPM. Compared to a centrifugal and most other juicers, this machine is quiet. It yields a fair amount of juice, and the juice won’t oxidize as fast because there is much less air inside it. The juice that the Omega VRT350 produces is on the pulpy side. If you don’t like to have pulp in your juices, you will need to pour it through a strainer. It has a Reverse function, which you will most likely need since this juicer is prone to clogging. You have to precut fibrous greens like celery, ginger, or kale stems into tiny chunks, so it doesn’t jam. However, it does a decent job with leafy greens if you operate it the right way. The small, vertical footprint will take up less space on your countertop. All of the parts that come in contact with food are BPA-free. Omega has a 10-year warranty on the motor and all other parts. Cons: The feed chute is quite small, which means you need to chop up your fruits and veggies. The juicer is prone to clogging, so you’ll need to cut fibrous ingredients, such as celery or kale stems, into tiny chunks. No spout plug to prevent drips when you turn the juicer off. Overall Opinion: The Omega VRT350 is a decent vertical juicer, but it does have its downsides. The juicer is prone to clog, and you will need to chop your stringy greens into small chunks. It’s not as efficient at juicing leafy greens as the Omega NC800. The Tribest GSE-5000 is the best juicer for leafy greens if you want to get the maximum amount of juice from minimum amounts of vegetables. It’s perfect for juicing tough ingredients like kale, spinach, celery, wheatgrass, and Swiss chard. And even with hard produce like carrots, it does a fantastic job. The GSE-5000 is the same machine as the GSE-5010 and GSE-5050. The only difference is the color. The chrome-colored GSE-5050 looks gorgeous, but it’s more expensive than the white GSE-5000. The Tribest is a premium triturating juicer. Triturating juicers are the most effective and best juice extractors, so they’re priced at the higher end. I promise they are worth every penny. These juicers mimic the way our teeth crunch and squeeze food. The pulp they eject is super dry, and you don’t have to run it through the machine a second time. Lower priced juicers don’t get the pulp nearly as dry. The Greenstar Elite operates with twin gears. Unlike any other twin gears on the market, these are special three-stage twin gears. The first stage crushes your leafy greens. The next step is the mixing stage that helps you pull more nutrition out of your vegetables. And finally, in the third stage, the juice is pressed out. Stringy veggies like celery or kale will be automatically cut short by the twin gears, effectively eliminating clogging. Because of the three-stage twin gears, the Greenstar Elite gets one of the highest yields for leafy greens of all juicers on the market today. The only juicer that exceeds the Greenstar Elite is the Super Angel Premium Deluxe. Especially if you’re juicing a lot of expensive organic produce, the Greenstar Elite is sure to help you save money in the long run. The juicer operates at 110 RPM, which means the fruits and veggies will be processed slowly. It preserves nutrients and gives you the highest juice quality possible. The motor noise is super low so you will hardly hear it working. This is perfect if you want to make your healthy green juices in the early morning or late at night, without worrying about waking up your family members. You can make large batches of juice in one sitting and store them for up to 72 hours in the fridge with minimal nutrient loss. This is great if you want to take your juices to work without having to juice every single morning. You have complete control of how much pulp you want in your juices. The juicer comes with a fine screen and a large hole screen. If you’re going to have a fine juice with very little pulp in it, use the fine screen. If you want more pulp in your juice, you can use the large hole screen. The Tribest GSE comes with a 12-year warranty. For the next 12 years, you’re guaranteed that you’ll be able to make healthy green juice for you and your family. Cons: As with most other cold press juicers, the GSE-5000 has a narrow feed chute. You’ll need to precut your produce. The GSE-5000 has a higher learning curve than other juicers. You’ll need to learn a few techniques to get the most out of your premium juicer. The Tribest takes a little longer to clean, but you’re rewarded in the taste, quality, and yield of your green juices. Overall Opinion: If you’re serious with juicing, go for the Tribest GSE-5000. The three-stage twin gears will give you the highest possible yield from your fruits and leafy greens. The juice quality is one of the best on the market today. Its only rival is the Super Angel, which costs three times as much. You’ll pay for a premium triturating juicer, and that’s exactly what you get with the GSE-5000. A juicer that will last for many years to come. Regarding juice quality and juice yield, nothing comes even close to a twin gear juicer. When it comes to triturating, twin gear juicers, there’s one company that stands out: Tribest. The Greenstar Pro is their newest model. The gears on the older Greenstar Elite model are made from steel and plastic. The gears on the Greenstar Pro are now 100% stainless steel, making your juicer more durable. If you already own an Elite Model, you can buy the stainless steel gears for $200. The Pro Model has an improved cooling system compared to the Greenstar Elite. The Greenstar Pro also comes with commercial certifications, and countless juice bars and restaurants around the world use this exact model. It’s a heavy duty machine with a 165-watt motor. The Greenstar Pro rotates at a slow speed of 110 RPM, giving you the most nutritious green juice possible. Like the Greenstar Elite, the Greenstar Pro comes with three stage twin gears. It produces the highest yield with minimal nutrient loss. The Greenstar Pro comes with Bio-Ceramic and Magnetic Technology, giving you the freshest, highest quality green juices possible by preserving vitamins and preventing nutrient degradation. All plastic parts are BPA-free. Just like the Greenstar Elite, the Pro model operates super quiet. You won’t disturb anyone while operating your premium juicer. The removable parts are dishwasher safe, but I always recommend washing by hand. The Tribest Greenstar Pro comes with a 15-year warranty for household use or a 3-year warranty for commercial use. That’s three more years than the Greenstar Elite and is one of the longest warranties in the juicing industry. Cons: Twin gear juicers are more challenging to use at first. You are getting a premium juicer, and every minute you invest in learning more about your machine is worth the effort. You’ll be rewarded with the best taste, quality, and highest juice yield possible. Overall Opinion: If you want one of the most durable and best twin gear juicers on the market, the Tribest Greenstar Pro is a good option. The motor, juice quality, and yield are exactly the same as the Greenstar Elite. The differences are the 100% stainless steel twin gears, integrated tamper holder, the improved cooling system, the commercial certification, and the 3-year longer warranty. You can’t go wrong with either the Greenstar Elite or Greenstar Pro. Both juice extractors are excellent juicers for leafy greens. So, you want to get the most efficient, best juicer that money can buy? Here it is. The Super Angel Premium Deluxe. This shiny beauty is made entirely of stainless steel. It’s constructed of only the best material, like surgical grade stainless steel, just like you would expect of a juicer in this price range. This juicer provides you with everything you have ever wished for in a juicer. The Super Angel Premium Deluxe is the upgraded version of the Super Angel 8500. The new model features an automatic cooling system that prevents overheating. The coolest new feature is the automatic reverse function. It beeps like a truck backing up and automatically reverses whenever something is stuck inside. You’ll never have to worry about clogging again. How cool is that? This premium juicer is a three-stage triturating juicer (aka twin gear), it pulverizes everything you put into it into a fine powder. The three-stage twin gears produce the driest pulp possible. The 3 horsepower motor makes the Super Angel Juicer one of the most powerful juicers on the market. There’s nothing that it won’t juice. The slow 82RPM Twin Gear ensure you will squeeze every last drop of juice from your leafy greens. It reduces the level of oxidation, and your fresh green juice will last up to 72 hours in your fridge. You can make large batches of fresh juice in advance, without losing too many nutrients. This juicer will give you anywhere from 10 to 30% more juice from the same amount of fruits and veggies than other premium juicers such as the Greenstar Elite. Let’s compare the Super Angel Juicer to the Omega NC800. The NC800 is already an efficient juicer, but still, the Super Angel yields 30% more juice. Especially if you are juicing a lot of organic produce, the Super Angel will help you to save a lot of money in the long run. I have summarized all results down below, so you don’t have to go through the videos in detail. That’s on average 16% more juice than the Greenstar Elite and the Omega NC800. Remember, the Greenstar Elite and the Omega NC800 are some of the most efficient juicers on the market today. But still, the Super Angel tops them easily. The Super Angel Premium Deluxe comes with a 10-year warranty on the motor and gears. A “Juicing Bible” with dozens of delicious juice recipes is included in the box. Cons: It’s three times the cost of the Greenstar Elite. The Super Angel is only worth the money if you’re a juicing addict (like me). Because it’s made entirely of stainless steel, the Super Angel is heavier than other juicers. Overall Opinion: The Super Angel Premium Deluxe is worth the money if you’re a heavy juicer. The Super Angel yields on average 16% more juice compared to other high-end juicers such as the Greenstar Elite and the Omega NC800. If you’re juicing organic produce daily, the Super Angel will pay for itself rather quickly. Even if you don’t like the taste of kale, I want to encourage you to keep trying it. Kale is one of the most nutrient-dense foods on the planet. It’s packed with iron. Per calorie, it has even more iron than beef. Without iron, your body can’t produce red blood cells, and it causes malnutrition and fatigue. The vitamin K in kale is essential for healthy bones and helps to stop bleeding from wounds. Kale also contains vitamin A, lutein, and zeaxanthin, all which promote healthy eyes. Your mom really was doing you a favor when she made you sit at the dinner table until you finished your broccoli. Like kale, broccoli is rich in iron, which is needed to transport oxygen throughout your body. The vitamin B9 in broccoli is essential for a healthy brain and your overall feeling of well-being. It keeps your hair shiny and your skin healthy while it detoxes your liver. Even a small glass of broccoli juice provides you with more than 100% of the recommended daily intake of vitamin K. Vitamin K is known as the “blood clotting vitamin” because it helps to stop bleeding from wounds. It’s also essential for strong, healthy bones and teeth, as it helps with calcium absorption. I know a few people who can handle a glass of pure broccoli juice, but I’m not one of them. The taste is way too strong. Try blending broccoli with sweeter fruits and vegetables such as carrots or apples. Like other leafy greens, Swiss chard is also rich in the blood clotting vitamin K. It provides your body with essential minerals like potassium, magnesium, and iron, as well as vitamins A and C. If you hate eating greens, juice them. Swiss chard juices well with lemons, apples, or ginger. I love juicing spinach! It’s simply amazing. It’s pretty much flavorless when juiced with other fruits and veggies, but it’s incredibly healthy. It provides you with all the vitamins and minerals you need. Spinach is a nutrient powerhouse. It’s rich in vitamins A, C, K, E, and the energizing vitamin B complex. Each ounce of spinach juice provides around 160mg of vitamin K, more than 100% of your recommended daily intake. Vitamin A helps support thyroid function and maintain your vision. Spinach is also rich in essential minerals like potassium, iron, and magnesium. The amount of iron is twice as much as the amount found in other veggies like cabbage. The powerful antioxidants in spinach help you achieve that all-natural glow we’re all after. The nutrient content of wheatgrass is equivalent to that of dark leafy vegetables. Wheatgrass is exceptionally high in chlorophyll, which gives wheatgrass juice its vibrant green color. It’s a great energy booster and is associated with many health benefits. The powerful antioxidants in wheatgrass help fight free radicals and prevent cell damage. It’s also anti-inflammatory, lowers cholesterol, and may help with weight loss. You can grow wheatgrass at home and make your own wheatgrass juice using the juicers introduced on this site. Learn more: 16 Best Vegetables to Juice + Top 10 Video. The juicers on this site are some of the best juicers for leafy greens. All of the listed juicers here are great for juicing kale, wheatgrass, Swiss chard, Spinach, and other leafy greens. I hope you’ve found this site useful to find your perfect juicer for greens, that matches your budget and needs. If you have any questions, I’ll be more than happy to answer them in the comments section below. Is It Safe to Juice Apple Seeds? What Does Aloe Vera Juice Taste Like? Hi Sam, I juice and make smoothies every single day. I didn’t want to miss the good feeling & energy it gives. You can check out my juice recipes for energy here: Juicing for Energy: 15 Energy-Boosting Juice Recipes. Wish you all the best. Hi Celeste, the juicers in this article are more on the expensive side. You need a powerful masticating juicer for juicing leafy greens. If you’re a beginner, I would go for a less expensive model. Here are more affordable juicers: Best Juicer Under $100.